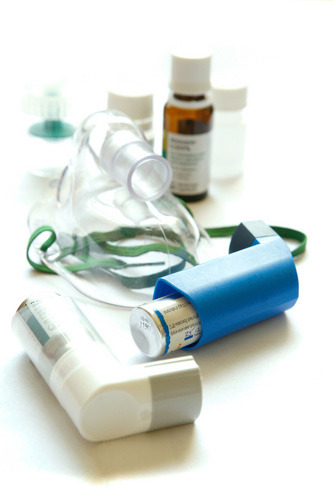 Modern treatment is effective at treating and preventing the symptoms of asthma. Having an annual review with the nurse or doctor is the best way to ensure that you are getting the best and most up-to-date treatment. The aim of treatment is to prevent symptoms so that you hardly ever need to use ‘reliever’ medication. This can be by avoiding triggers that you know make it worse, not smoking, and if necessary by taking preventative medication which is safe and effective. Relievers – these inhalers (usually blue) directly relax airway muscle, opening up airways and making it easier to breathe. Preventers – these medicines act to reduce the inflammation and mucous in the airways, and help to reduce airway muscle contraction. These are usually inhalers too, although sometimes various tablets are also used. Flu Vaccination – each year a vaccine is developed to protect you from the current most virulent strains of influenza virus. It is available from GP surgeries in the autumn and is well worth having if you have asthma that requires regular prevention treatment, (or certain other chronic conditions, or are over 65). If you think you may have asthma and want to find out more then you can make an appointment to see one of the nurses or doctors at the Health Centre. We offer full child health surveillance including regular developmental checks and immunisations for the Under 5s. Child health reviews are carried out by the Doctors and by our Health visitor. Birth Review - For the first ten days after your baby is born both you and your baby will be under the care of a midwife who will visit you at home as often as you both think is necessary. She will be able to deal with any concerns you may have. She will make sure the baby is feeding well and will also monitor his or her weight. 10-14 day Review - The health visitor takes over the care of the baby from the midwife at around 10 days and will continue to monitor the baby’s health including weight. She will also examine the baby’s hips to check they are stable. We work very closely with the Nottingham University Counselling Service and have regular meetings to improve service provision. Students can refer themselves directly or may be directed between services. Often students see their GP and the Counselling Service at the same time. The Counselling Service offers a full range or therapies and support to people directly connected with the University, ie staff and students. This means some patients of Cripps Health Centre are not eligible to use this service. They should consult with their GP who will find an alternative appropriate route. The Counselling Service website gives details of the services provided and how to access them. Dermatology is the medical speciality that deals with diseases of the skin and their management. Skin disease is a very common complaint in our practice and is one of the most frequent reasons for consultation at the Health Centre. Problems with skin and hair are also included in this speciality. There are many other types of problem that occur that we will also be able to help you with. All the doctors are skilled in the diagnosis and management of skin problems. In addition, Dr Manktelow has a special interest in this subject and holds the Cardiff Diploma in Practical Dermatology. Occasionally some skin lesions can be uncomfortable, or may repeatedly catch on clothing. At Cripps we are often able to remove these for you. Please make an appointment with one of the Doctors if you wish to discuss whether Minor Surgery is appropriate for you. Warts and verrucas can often be treated by topical medication that can be bought from a pharmacy. The aim of treatment is to control blood glucose and minimise the risk of complications. Having regular reviews at least annually with the doctor or nurse, of different aspects of health that can be affected by diabetes is essential to ensure that treatment is effective and adequate to minimise the risk of complications. Type I are usually cared for both by GP and as an outpatient at the local hospital. In Nottingham the opportunity for students to transfer case from their home town to Queen’s Medical Centre (QMC) is available, where there is a very comprehensive service available, with a very experienced and supportive team of doctors and nurses. Open Monday – Friday 2 – 3:30 pm. The team can be contacted Monday – Friday 9 am – 5 pm on 0115 97 09215 for advice on any aspects of your diabetes care. More information about diabetes can be found on the NHS Choices website. Our midwives have special training in the care of pregnant women and their newborn babies. They will provide antenatal care throughout pregnancy until around 10 days after the birth of your baby. Clinics are held each week at the Health Centre on Wednesdays. If you think you may be pregnant you can self refer to the midwife team by calling 0115 8833100. Your appointment will take around an hour and will involve a detailed health review and an explanation of your antenatal care including what future appointments will be required. For problem-free pregnancies most of your antenatal care will be provided at the Health Centre by the midwife and your GP. As a team we perform a number of minor surgical procedures, examples of which are below. You may find it useful to make your first consultation with a doctor who performs a particular procedure ─ this can be discussed with the receptionist when booking. We believe that performing these procedures in general practice gives our patients faster access to a more convenient service. However, there are limitations to procedures we are able/allowed to perform. Minor procedures for purely cosmetic reasons are not funded by the NHS and therefore we do not offer them. The University Physio holds regular clinics at the Sports Centre which can be booked via reception. Sports centre members can access a wider range of appointments for this service by booking directly with the sports centre reception.